Selectable: indicates whether the object can be selected in the scene. Objects can always be selected in the scene hierarchy. Refer also to the sim.setObjectProperty function. Invisible during selection: when enabled, then the object will be invisible for the selection process (i.e. you will be able to select through the object). Ignored by depth pass: when enabled, then the object will be ignored during the depth rendering pass. The depth rendering pass is used to correctly position the red sphere for camera movements. Select base of model instead: if enabled, then selecting the object in the scene will select its first parented object marked as object is model base instead (see further down). This property is convenient when protecting a model from faulty manipulations, allowing it to be manipulated as a single entity together with other objects. Refer to the section on models and also to the sim.setObjectProperty function. Ignored by model bounding box: when selected, and the object is part of a model, then the model bounding box (i.e. model selection bounding box) will not encompass that object. This is useful for invisible objects that might make the model bounding box appear too big. This property has no functional effect. Refer also to the sim.setObjectProperty function. Ignored for view-fitting: objects with this item selected will not be taken into account when fitting a scene to a view while no object is selected. Usually floors and similar will be tagged as such. Refer also to the view fitting toolbar button and to the sim.cameraFitToView api function. Cannot be deleted during simul. : when enabled, then the object will ignore a deletion operation when a simulation is running (deletion will however still work when triggered via code). Cannot be deleted: when enabled, then the object will ignore a deletion operation (deletion will however still work when triggered via code). Extension string: a string that describes additional object properties, mainly used by extension plugins (see also the sim.getExtensionString API function). 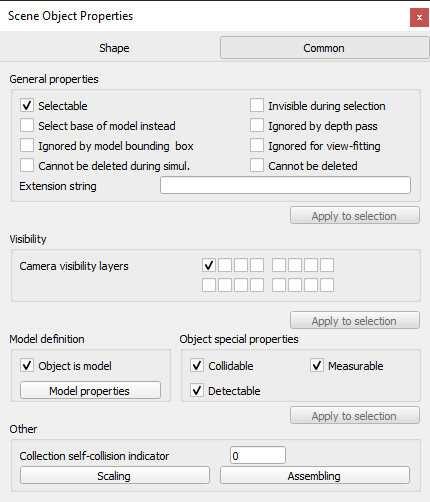 Camera visibility layers: each object in V-REP can be assigned to one or several visibility layers. If there is at least one visibility layer that matches the layer selection dialog layers, then the object will be visible when seen from a camera. By default, a shape is assigned to the first layer, a joint to the second layer, a dummy to the third layer, etc. Can be seen by: allows to specify a camera or vision sensor (or a collection containing cameras or vision sensors) that will be the only one able to see the object. Collidable: allows enabling or disabling collision detection capability for the selected collidable object. Measurable: allows enabling or disabling minimum distance calculation capability for the selected measurable object. Detectable: allows enabling or disabling proximity sensor detection capability for the selected detectable object. Clicking details allows you to edit the detectable details. Renderable: allows enabling or disabling the vision sensor detection capability for the selected renderable object. Object is model base: indicates whether the object should act as the base of a model. An object flagged as base of model has special properties (e.g. saving or copying the object will also automatically save/copy all its children and children's children, etc.). Additionally, when such an object is selected, the selection bounding box is displayed as thick stippled lines, encompassing the whole model. Refer to models, and to the select base of model instead item above. Edit model properties: allows opening the model dialog. Object / model can transfer or accept DNA: when this feature is enabled for an object or a model, then it will share a same identifier with all of its copies. An Object or model can then transfer its DNA (i.e. copy an instance of itself) to all of its siblings (i.e. objects/models with the same identifier), via the transfer DNA toolbar button. Imagine having 100 same robots in your scene that you want to modify in a similar way: simply modify one of them, select it, then click the transfer DNA toolbar button. This item should almost always be checked for a model base (see further up), to facilitate model re-instanciation. Scaling: objects or models can be scaled in a flexible way in V-REP. The size of an object or model, and all related properties are scaled appropriately (e.g. joint ranges, velocity settings, masses, etc.) so that the scaled object or model can normally continue to operate (but at a different scale). Required match values for parent: the object can be attached to another object (i.e. become another object's child), but only if one of the listed required match values for parent matches one of its new parent's required match values for child values. This feature is useful in order to set a fixture compatibility criteria (e.g. gripper A can only be attached with a robot that has a tooltip of type A). Required match values for child: the object can have another object attached to itself (i.e. become another object's parent), but only if one of its required match values for child matches one of its new child's required match values for parent values. This feature is useful in order to set a fixture compatibility criteria (e.g. gripper A can only be attached with a robot that has a tooltip of type A). The object selection order is important for assembly operations, i.e. first select the to-become-child-object, then the to-become-parent-object. If the selection order is wrong, or if the to-become-parent-object is not appropriate, then V-REP will try to guess what the real intention of the user was (e.g. by searching for an appropriate match in the to-become-parent-object's descendents), if there is no ambiguity.